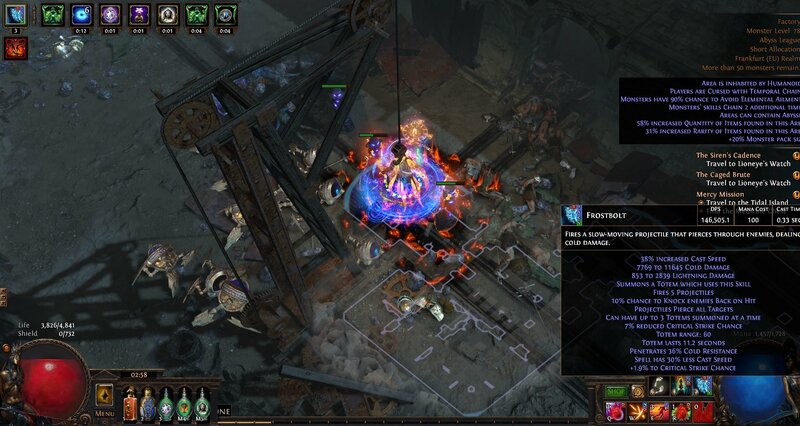 [3.1] Budget FrostBolt Totems 1mil+ dps on 6link -Fast clear -Guardians & Shaper down! Picture of DPS fully buffed solo. 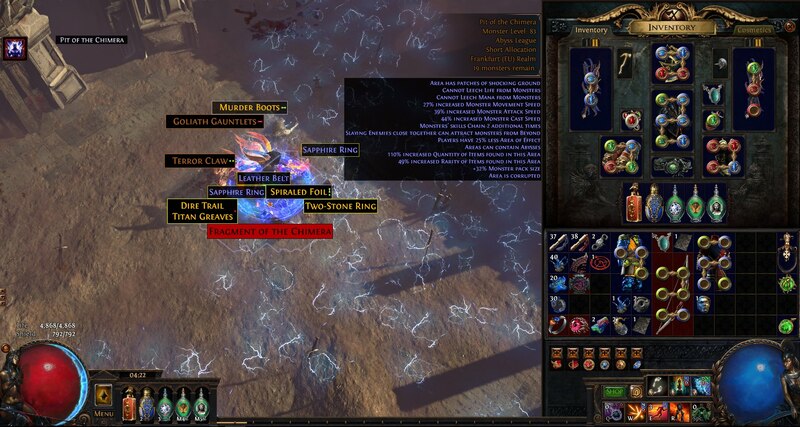 146,505 each totem not accounting for projectile weakness, cold penetration or vaal lightning trap on a 5 link. Looks like a lot but only takes a couple of seconds, also very good if u decide to play a few shaper runs. Now this build might not be great for beginners, i have 7 skills active along with the 5 flasks. This should be active as much as needed, it adds a huge chunk of dps. around 20% of it. We activate this by linking it with Increased Duration and Projectile Weakness. (BOSSES SHOULD ALWAYS BE CURSED WITH THIS!) now remember, even with increased duration Arcane surge is only active for about 7 seconds. Great for movementspeed and cast speed. Is A and O in this build, the damage isnt bad without them but they add way to much damage to not keep up during the map and on bosses. Just place totems more often if you feel you are having problems with maintaining them. Are super important to keep up as much as possible, you should use these flasks smartly. And if you are doing a bossfight and run out, a town visit will re-charge them and can save you time. We are NOT supposed to flame dash over mobs in this build, that's the reason we're scion and using totems in the first place. When you crit a mob you take 400 x 2 x amounts of power charges you currently have active. This is why I highly recommend brightbeak in weaponswap, partly for backtracking but also to move forward sometimes if there's a big space to next pack. "Im taking damage but im not using flame dash over mobs?!" This means you probably have a glove enchant which does some damage and can crit. Some of the recommended gear is not to be used during this stage of the build, prioritize hp before damage! Also, don't use shimmeron before you've done cruel lab. As stated, they wont be amazing without power charges! and no, this is not how you should build this character, it would be solely for quick gearswap when doing shaper/guardians or red elder to optimize damage. I dont know why this weapon is so cheap. Beats void battery in damage while going for the same things a void battery build would go for. For extra projectiles, a must. 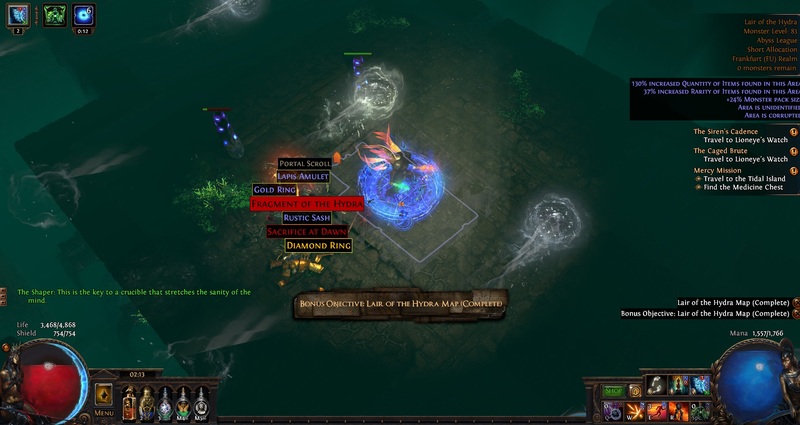 Boots - Movementspeed, life, res -- *new* If you are playing hc, consider using corrupted gloves with temporal chains curse and go for whispers of doom on passive tree. Belt - Life, resists, %reduces flask charges used. Pref abyss belt for extra jewel. Jewels - 2x Frozen Trail jewels, Clear mind and then rare damage and life jewels *if missing dex/str consider using pure talent for 25 to all attributes and 5% ele pen. You start off with fire trap + freezing pulse until you get access to 1x frozen trail jewel and 1x clear mind. Then you swap to frostbolt. And when you reach ancestral bond you go totem. Look in link section for gem priority. Until you get access to those gems added cold is fine, maybe even at mid level, you'd have to see the dps numbers for yourself. I recommend getting diamond flask early, with axiom we go crit instantly. In bandits we get alira for mana sustain and crit damage, the res is also nice. Gonna do videos of these fights as soon as i move. Fight was pretty easy, altough with 2 damage mods he chained my totems and killed me with a oneshot and when i reentered there was some invisible thing going on that also killed me as soon as i started to move due to my golem triggering this area attack probably.. Other than that the dps was great! Still on a 5l. Minotaur was the longest fight of them all, but have been due to the mods. Super easy fight, make sure to weapon swap when he does cloud phase, thats the only part that would be able to kill you. So shaper is down on first attempt. Died twice due to poor play but he's definitely doable without dying! +Very fun, it's more engaging and mechanically fun than a regular spell caster. For ascendency we chose hierophant for the power charge generation and Pathfinder for the extra damage and movementspeed. There is no other class for this build, we need those power charges up all the time. "No Shieldcharge = sucky slow build" Well you couldn't be more wrong. Most shieldcharge builds doesn't come close to the clearspeed of this beauty, 3 totems combind with frostbolt clears several screens and permafreezes even abyss rares tier 15 maps. And we play with haste and pathfinder = 20% free movementspeed pre boots. Also for backtracking we use brightbeak in off-hand with shieldcharge. Also when you get 6link you can use brightbeak for trashclear very effectivly! "Most of these totem builds with multiple projectiles has severe single target problems, how does this build handle single target?" 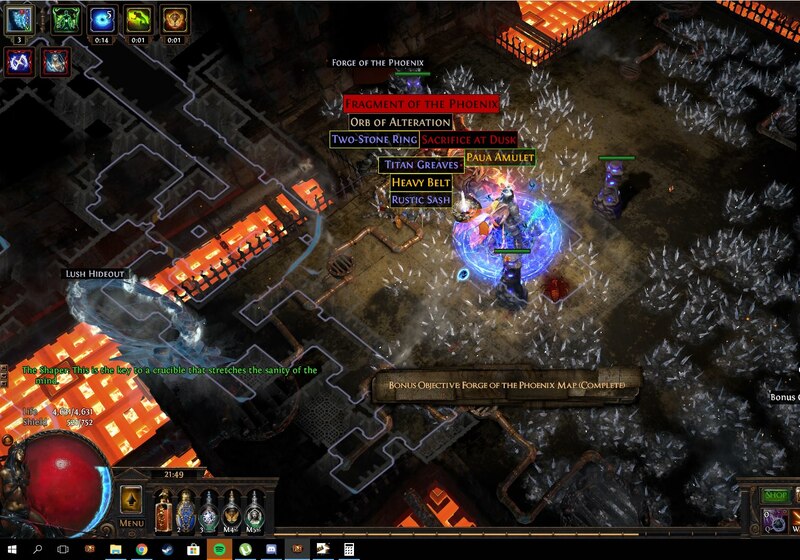 Lets just say I killed uber izaro in less than 3 seconds solo. As for tier 15 it takes about 30 sec, but with a decoy totem you are very safe from taking damage. "Does this take long to level?" 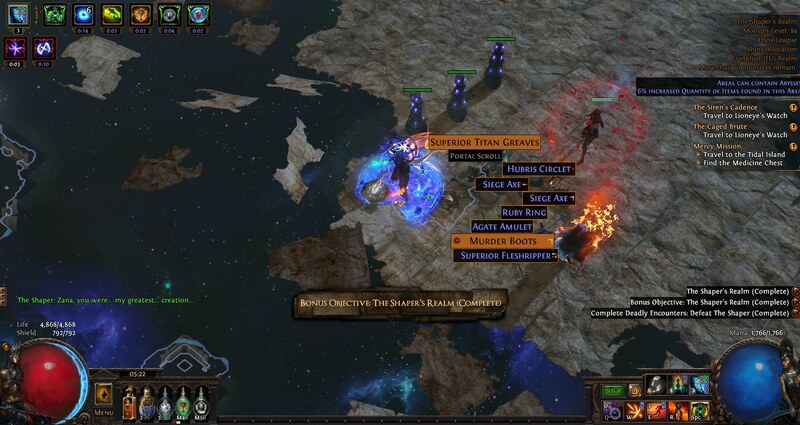 Im not a fast leveler and I got to act 10 in less than 6 hours never taking off axiom perpetuum, instatly swapping tabula for soul mantle when 49. I highly recommend trying this build, can even be played as spark with just a few changes. And the leveling is also really easy. How would you recommend leveling this build? Check out www.RavenousEternalHunger.com for epic demon-slaying metal! Well, on SC wand is still cheap, got 2 for 4c each today. Requesting more info about best gem stats. Also, is it possible to use 2x Kikazaru and self-flagellation jewel? Jewel adds good chunk of damage under all those curses. hey what do u think of this version? I actually havent updated my current setup, im using brightbeak / attackspeed shield in offhand to travel when backtracking. The reason i had 6 glacial cascades was because i was playing glacial mines as my first character which was pretty good but slow and dangerous and those gems were almost 20 :). I have no problem with single target so far. 450k dps vs shaper/guardians with decoy totem nothing really touches you. Also i freeze every rare/white mob in t15. I recommend watching my profile for my current setup / putting it into pob and testing urself. About kakazaru, sure. It would be amazing, but then we'd have to go away from scion hierophant which means power charges will be really annoying, maybe Inya's Epiphany + jaws of agony. But that's a lot of work just to maintain charges. Also that would mean we'd be losing decoy totem. But I would recommend trying the build and then be looking for changes if the dps isnt enough. Im having 0 dps problems in t15 on a 5link. Not sure what im looking at, i dont see any build info?